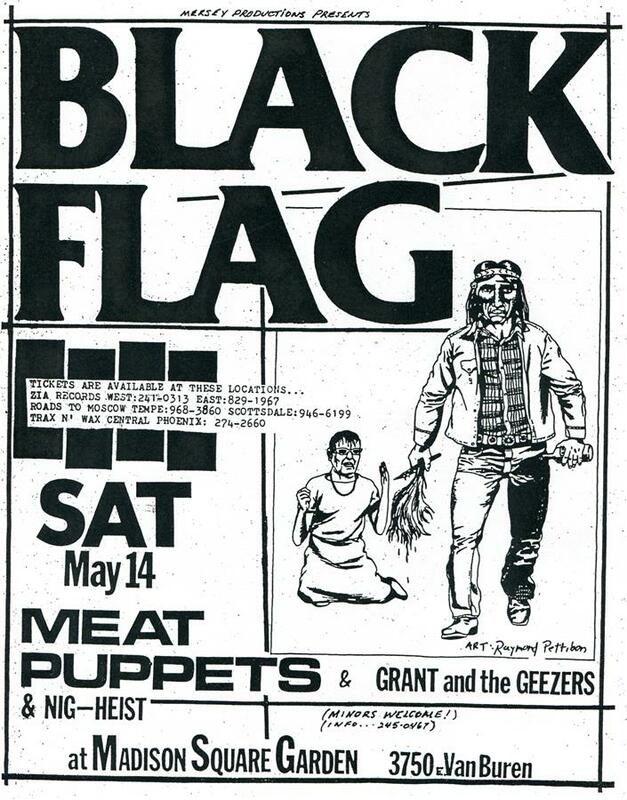 When I was 15, I became obsessed with Black Flag, playing everything up until “My War” on full blast at all times possible on my headphones. Even when I traded thrash and patches for cardigan sweaters and indie rock, I still put pre-Rollins songs on mix-cds and played the audio version of “Get In the Van” for long car trips. 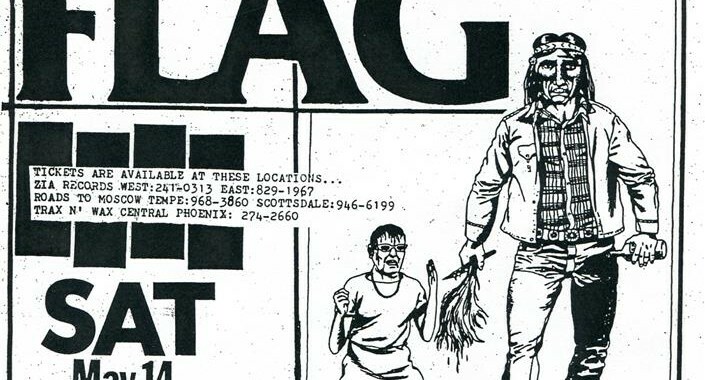 I always wondered at the album art work and the flyers, the imagery bleak, anti-authority and black in humor. I ws familiar with some of his work outside of punk rock, as the imagery was always so striking. 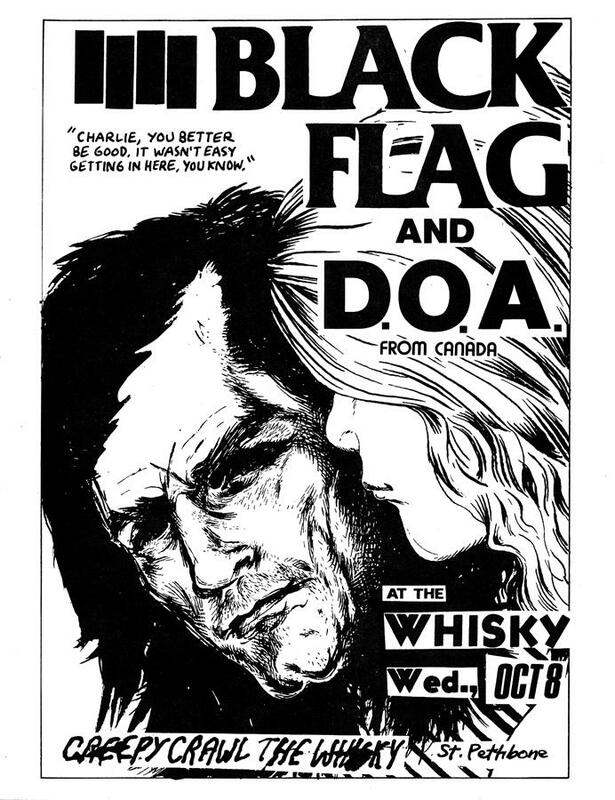 Years later, I found a Raymond Pettibon zine being sold by Ooga Booga out in Los Angeles and was surprised and shocked to see he still did things like this, even after I read the long profile of him in the New York Times Sunday Magazine in 2005. I contacted Raymond through Facebook, figuring it was a long shot. To my surprise, he messaged me back almost immediately and gave me his phone number, telling me was staying in the East Village for about a week and wouldn’t mind being interviewed. I invited him to come to ABC No Rio and contacted someone who put me in touch with a professional photographer, Nick Weissman. I kept my mouth shut until the day of the interview and then met up with him in front of the building. I figured the zine library was an appropriate enough place to pick his brain on zines and art. EN: When was your first zine? RP: It was in ’78. It was called “Captive Chains.” I still have a bunch left over. Depending on the printing process, it can cost about nothing at all to do a higher print run on newsprint, rather than on fancy paper. The print run was more than others, in the neighborhood of 500. These are printed offset, partly mimeographed even. With Xerox, the technology changed. Later ones were only 35, 50, 75 or 100 at most. That was accommodating the market. EN: What was your motivation to self-publish? RP: It wasn’t like I was turned down by Random House. Like with punk, it didn’t choose to avoid major labels. Major labels ignored them. EN: Can you tell me a little about your experience as a high school math teacher? RP I taught for a few years, all over. I was a substitute at first. It was very hard to do. I missed it for a long time, though. It can have rewards on different levels. I knew math well enough to teach, because my background was economics, which is math-oriented. EN: I read you took a lot of literature classes at UCLA when you went there and was curious about if that shaped you as an artist. RP: It didn’t take a lot. There’s only so much you can expect to receive in what is otherwise a passive affair. Of course you are engaged with a teacher or professor. I would hesitate to say I was schooled and leave it at that. Liberal arts education has changed quite a bit as it’s become geared towards the professionalism of whatever the discipline is. I didn’t have a truly straight and narrow path. I already lost interest in economics by the time I was fully committed to it. Lately, I’ve come back to it. RP: Not on a professional level, but the work I do as an artist can be drawn from anywhere. It’s not confined to the canvas or the page with lines and masses. What you see in the works as they come out, there’s a lot more involved. EN: Why do zines still? RP: I do both. I would do more zines than I have if I could get around to it. It’s fairly easy. I’ve been a one person operation. It’s not like it’s a huge task…well, it can be. I could do more if I was in the business of copying, folding and stapling. Originally, I didn’t really sell any. I think they sold in New York. They’re still worth doing, in a way to have a record of something. But it’s between a gift and a theft, if you add the marketplace, to give them away. If you have a box full of zines you’re giving out on the street, most motherfuckers will cross the street. I want to be as much as I can, the democratic, no the soup kitchen artist. If someone is making the effort to stand in line, I’m not going to fill the halls with pamphlets. The print runs were reasonable then as they would be now if I did them as regularly. It wasn’t to make them precious or collector’s items. The reason why I would keep doing them is also because my work is suited for the book form, a cheap reproduction. Not to choose, but with the book form, the attention span compared to a work on the wall is why I would have great regrets if I gave up that medium. EN: What is some of your recent work? RP: I just finished a show in London. That’s just work I just finished. What I’m working on now, well the work is evolutionary. It’s become largely more collage, montages with cartoons and comics, some things that have been there from the beginning. It makes it more time consuming, but it’s not. The work takes longer to finish because of the complexity. I tend to be playing catch-up to finish. EN: I wanted to ask you about a zine of yours I have, called “Major Arteries.” Can you comment on the repeated imagery of trains in it and in your work in general? RP: The train is an image that tends to reoccur again and again, not for any grand scheme but because it has more for me to say. Visually trains are a compelling image for me to draw. That’s one reason, but not the sole. The subject is usually the closing of America with the development of the B-1 Bomber. It’s gone beyond the border with Manifest Destiny and so forth. There’s some of America becoming fully extended. Trains now are considered Americana. They’re a thing of the past, picturesque. At first, William Morris, Carlyle and other anti-industrialists would consider them overhill. Now look at us. To me it’s an auditory experience. Growing up, I always had trains around and you could hear them more than see them. The tracks divided the good and bad parts of town. I wasn’t exactly on the good side. You weren’t encouraged to play around the demarcation lines. The image of trains gives you a sense of distance, going to and from a place. Where I grew up, there were a lot of Okies, like in the Grapes of Wrath, and Roy Rogers was on television. With my work, visually I don’t have a great amount of room to work with. For the most part, drawings and words are broken into parts. As for trains, it’s an image that carries a lot of associations and meaning to it. When you work with a single image and certain lines of text, you don’t have the means to have a convoluted narrative. I mean there’s Buster Keaton tying a damsel in distress… I don’t really start from scratch. The automobile is the same. A lot of kids go through their car phases. I went through a B-17 phase because my father was a navigator, but it hasn’t resonated to me like a train has. Beyond that, I don’t know. There may be some hidden recesses. Hitchcock, wait was it Hitchcock? Yeah, he said “sometimes a train going through a tunnel is just a train going through a tunnel.” He was sophisticated, but he wasn’t adverse to the obvious. That had its purposes as well. EN: In ‘Major Arteries’, I also noticed some drawings that looked like they were done by a child. Was this the nephew that I read about in that Times article on you? RP: I’d assume that would be his or his sister’s. It could also be mine from when I was small. That doesn’t happen too often where your mother saves work from when you were 4 or 5. I did a lot of work with my nephew and niece at age 3 or 4. As crude as my drawings can be, I wish I could draw like a child. I don’t think anyone has attempted it. The obvious way around this is to bring up work from the past or get my nephew or niece to do it for me. RP: I say that in complete sincerity. But laughter has a place in it too, it goes together. They did some amazing stuff. I love children’s work. EN: How old are they now? RP: They’re in their mid-to-late 20’s now. Alex is a musician. 1208 is his band. They were on Epitath, I think. EN: Do you still play music? RP: I write songs and sing at times. Peripherally, though, it’s not my calling. At least, I assume that because the number of curtain calls hasn’t started. EN: Would you want to do any zines in the future? RP: Absolutely, I would love to do more. I have a lot of material, especially if someone asked me to do one for them. They’re in the realm in what I figure my competency is, in being able to work with images and words at the same time. It’s very rare I produce something that’s one or the other. It depends on both. It’s not making a huge crossover or working in a form that’s’ different than what I’m used to. It’s much the same in many ways. 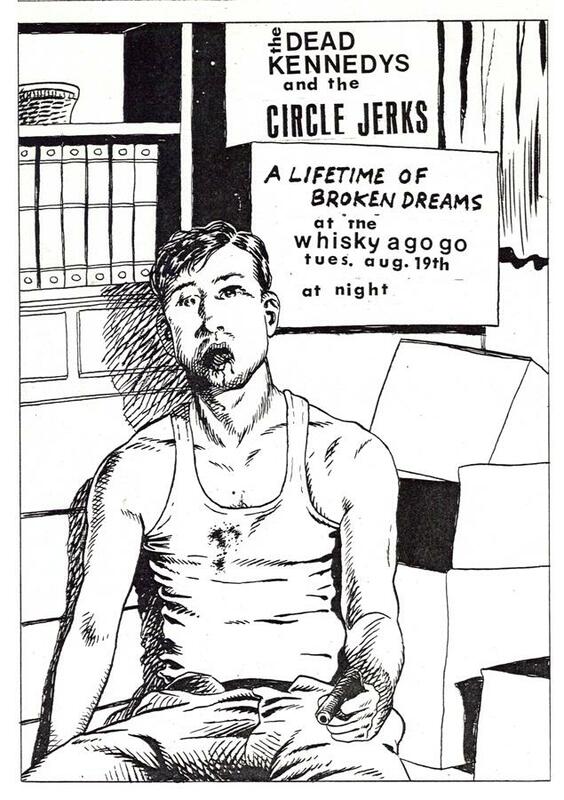 Posted in Interviews and tagged Archive Highlights, Art, Culture, Interview, Raymond Pettibon.